Miller’s Bottled Gas served the Bowling Green, Kentucky, community for more than 70 years. Its customer-oriented business is consistent with how Blossman operates, according to Blossman CEO Stuart Weidie. The award recognizes NET Trans’ commitment and successful transition to propane autogas use in its fleet. 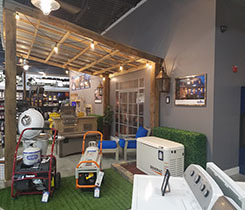 Blossman Gas & Appliance opened a North Carolina store that houses an 8,000-sq.-ft. showroom, autogas filling station and appliance displays.